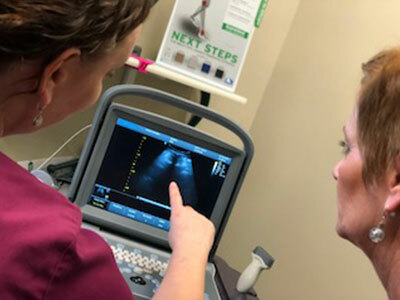 Diagnostic ultrasound scans in Rockford, IL: Musculoskeletal diagnostic ultrasound scans are ways of looking at muscles, soft tissues, ligaments and tendons within the body in real time. The scans are used to evaluate problem areas and identify any inflammation, areas of pain or other conditions. They use sound waves rather than radiation, which is why it is more popular and seen as a safer route than other imaging methods like x-rays. Common areas treated include hand, wrist, knee, ankle, shoulder, hip and elbow. 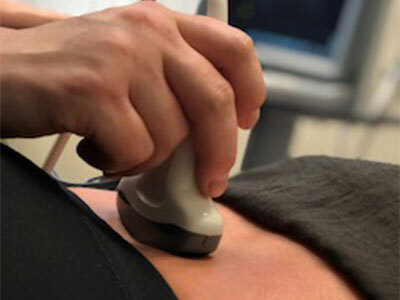 Ultrasound scans can be extremely useful following sports injuries as well. Once you are sitting or laying down, a lubricating jelly will be applied to the viewing area’s skin. This jelly not only helps transmit the sound waves from the probe but it prevents friction between the probe and your skin. The probe then sends high-frequency sound waves through your body. These waves cannot be heard by the human ear as they are at an extremely high frequency. The waves travel until they reach more dense objects. As the waves hit these objects, they echo back and are reflected into a computer. These echos create a picture that can be viewed and examined. Diagnostic ultrasound scans contain no radiation, so these procedures are safe for everyone. Scans are typically taken every few weeks to check on the progress through the treatment phase for each patient.